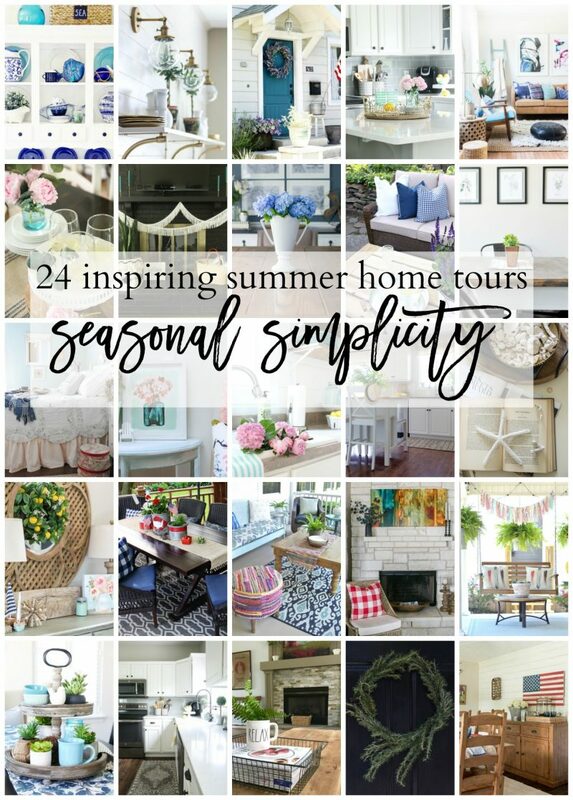 Summer Home Tour | Sincerely, Sara D. - Sincerely, Sara D.
I am excited to be sharing my summer home tour (along with several other bloggers) for the Seasonal Simplicity summer home tour. If you are are here from At Home with The Barker’s, welcome! 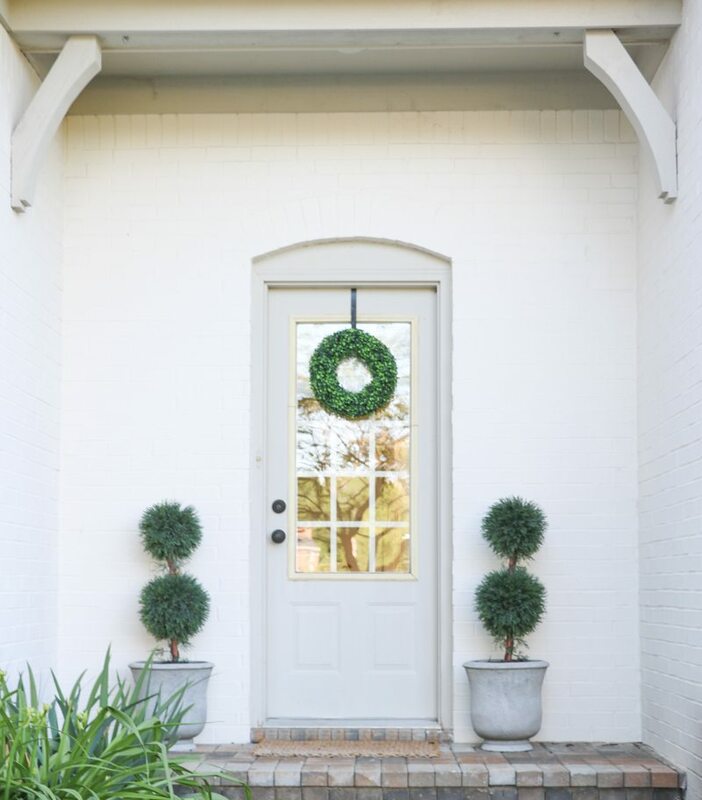 I am currently obsessed with adding greenery and topiaries to my home – inside and out! 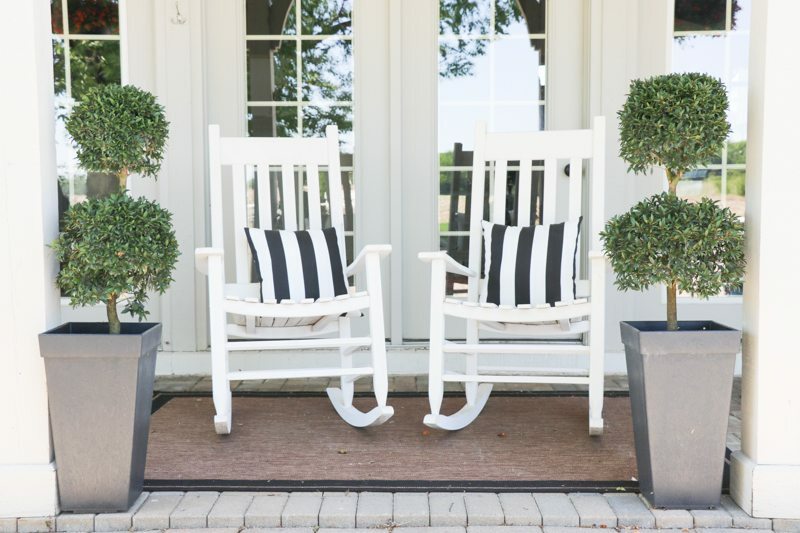 The front door has artificial boxwood topiaries and a wreath along with little live evergreens surround by pink petunias. 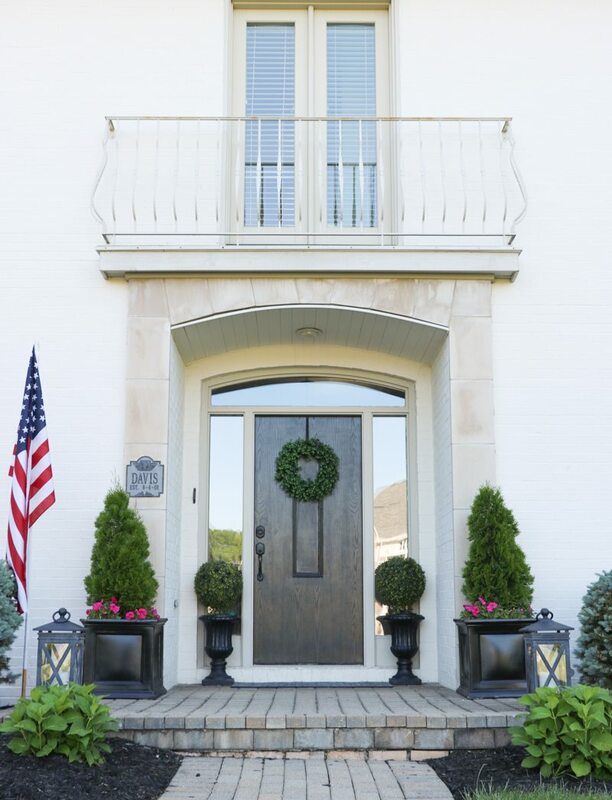 We have a side entrances that I also have artificial topiaries and a boxwood wreath. I love them because they look real but last year round AND don’t require any maintenance! 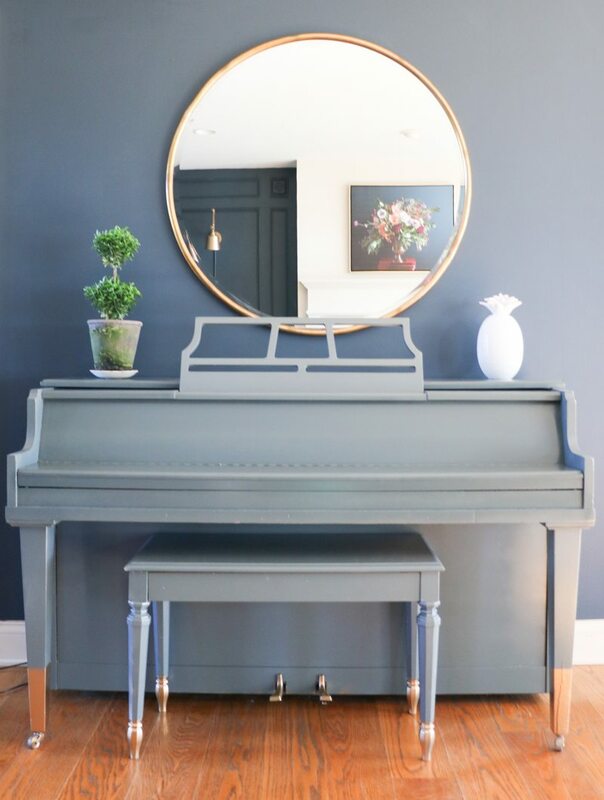 I added the sweetest double boxwood topiary to our piano. I found it at Hobnob market, and you can see all the details of that trip HERE. Just beyond my piano wall is a wall of greenery. 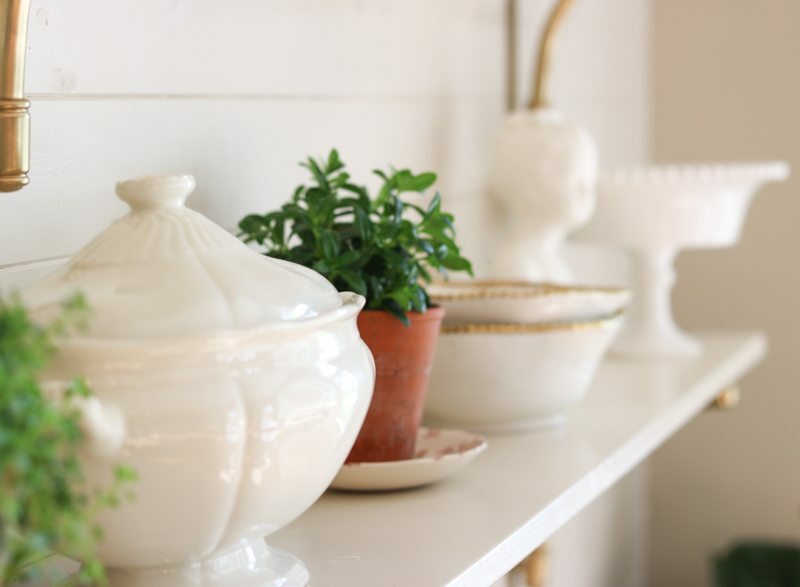 I added open shelving in our kitchen nook, and it is the perfect display for my white dishes and plants. The contrast between the two is just gorgeous. All of the little potted plants were from the market I mentioned earlier. I water my plants routinely once a week on Mondays – this way I don’t forgot to water (and don’t overwater). I love bringing the outside in with these gorgeous plants. 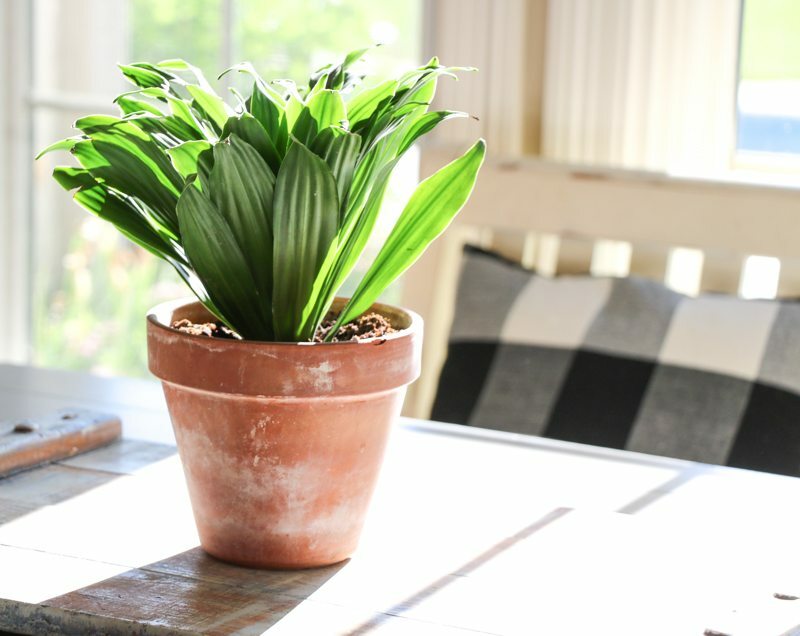 My kitchen table also is simple with just a plant in a terra cotta pot. 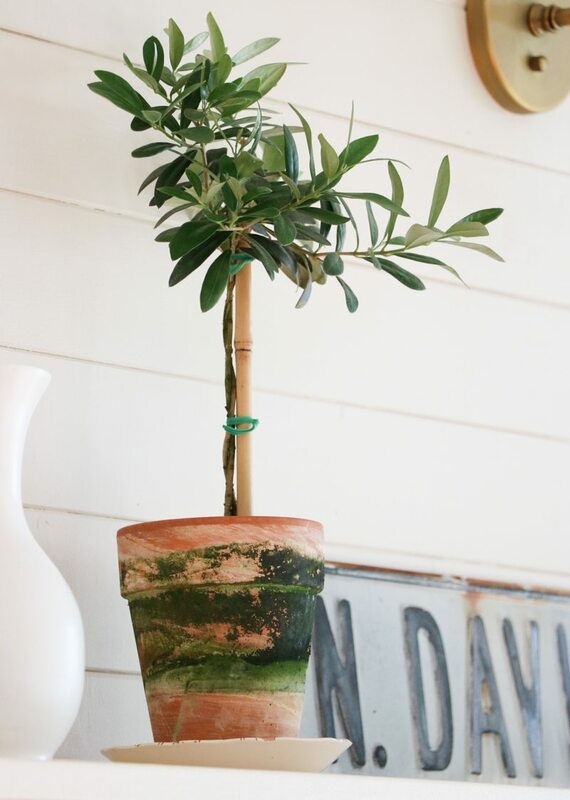 I love welcoming summer in our home with all the greenery and live plants while keeping it simple and fresh. 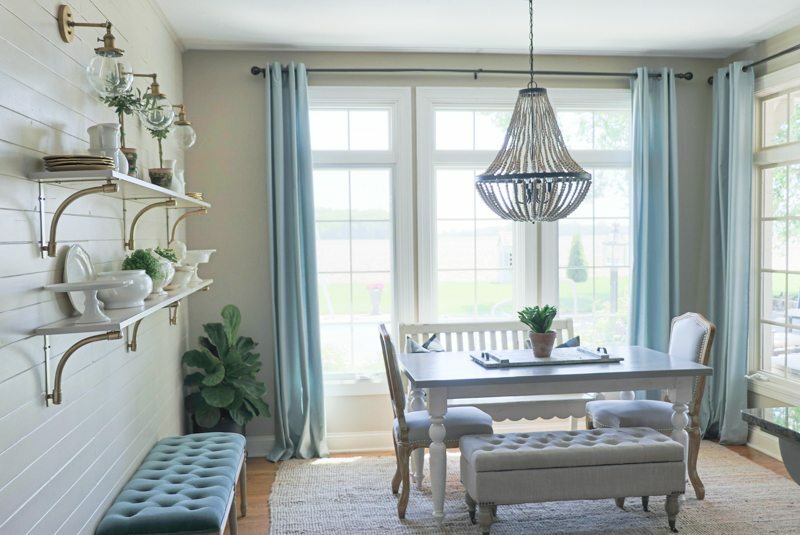 Don’t forget to check out all the other blogger’s summer home tours, and if you’re following the blog hop, be sure to visit! so pretty, sara! i love the lighting over those shelves SOOOO much, and your entry is beautiful! the topiaries are perfect. Who makes those light fixtures? Your home is lovely, Sara! 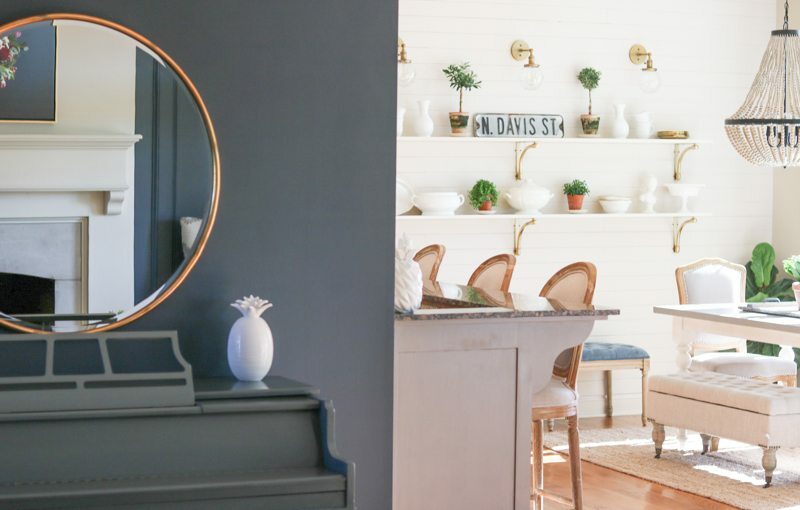 I love the contrast of the round mirror on that dark wall and those shelves are to die for! Thank you so much April – I appreciate your sweet words! Thanks so much for hosting this summer tour! Beautiful, Sara! I love all those sweet topiaries!! Your home is so welcoming with all the topiaries and plants. I am so in love with those open shelves and lights! Sara all those little green bits here and there are perfection. You truly have an eye for classy and simple. Just lovely. 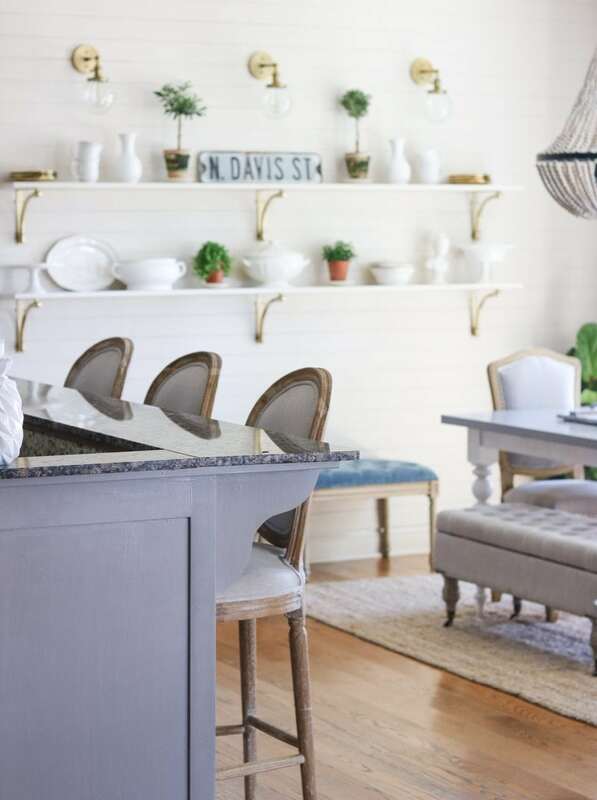 Love, love, love the open shelving in your dining area!! The touches of greenery are perfect! 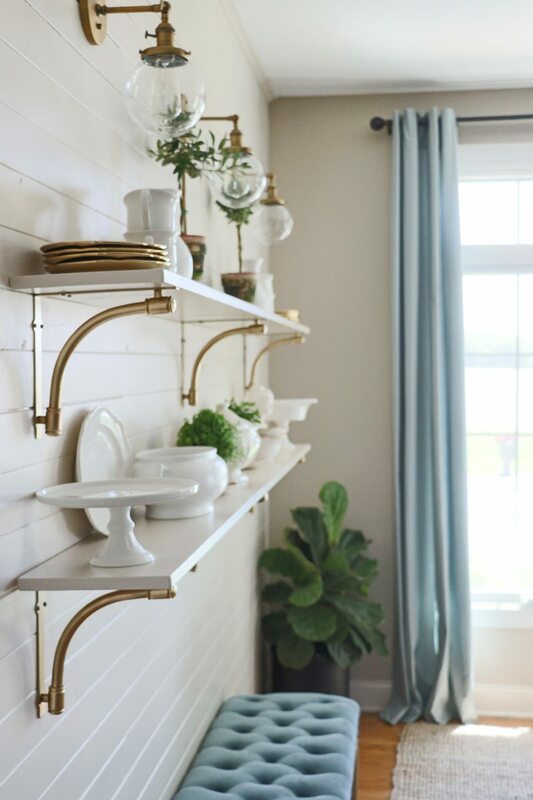 Fresh look to white shelves with your gold supports and light fixtures. It’s a nice change from the usual black and white country look. 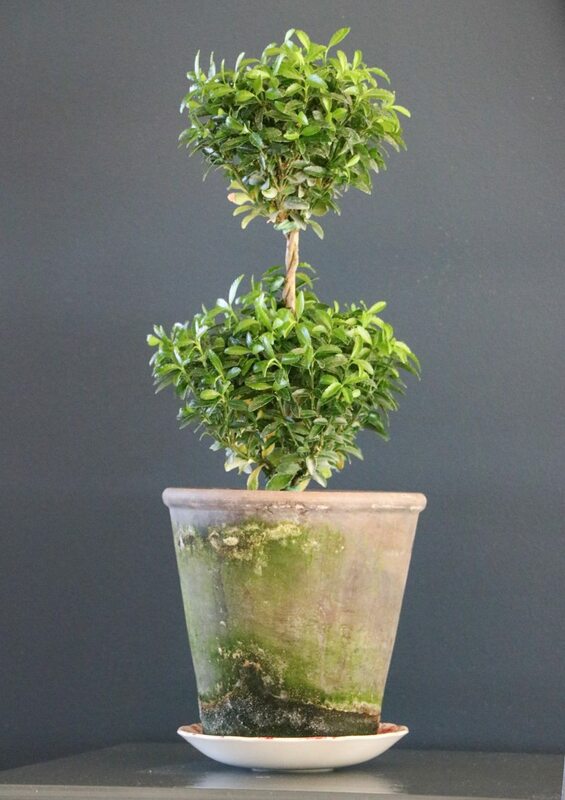 I, too, am a topiary fan and love to bring fresh greenery into the house. 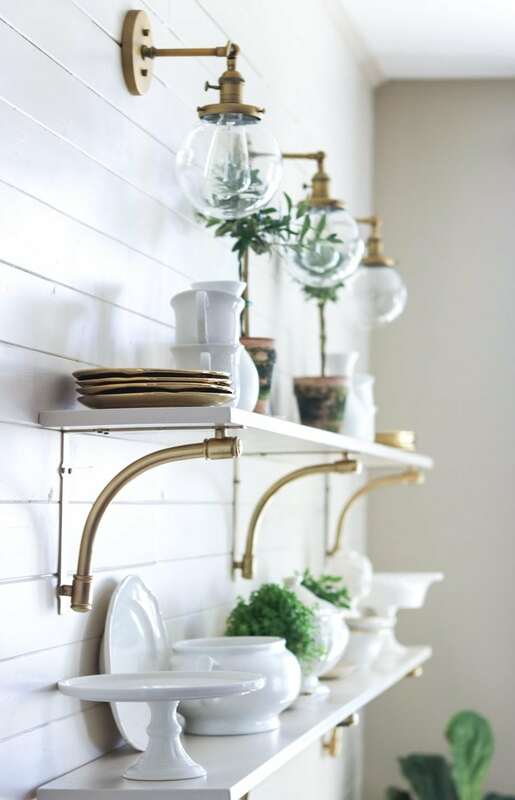 Gorgeous open shelving! Love the live greenery. Where did you get the shelves with those brackets. I have been looking for something like that for my bathroom. They look great in your room.